With 1B no longer an option, it's time for him to step up his game behind the plate. So maybe Future RF now? That's the biggest problem with the Tex signing. They have no room to move people around, or bring in prospects. Jeter is stuck at SS, Arod is stuck at 3B for years. Right now they are OK defensively, where will they be in 2 years? Tex is good, good for defense, good hitting, switch hitter. In the next few years, the Yankees defense may become awful. They still have a DH position, and a couple Corner OF spots open long term. A propsect like Montero might take one of them down the line, but no reason A-Rod or Jeter can't find a spot should they need to move. If that's true and he's just spinning his wheels at Catcher, stick him in the Corner Outfielder immediately because we'll need one of those real soon. We have an elite CF Prospect with Jackson, but we need an elite COF Prospect as well. Do what the Brewers did with Ryan Braun only don't wait till he gets to the big leagues to make the switch, let him start getting adapted to the COF immediately in the minor leagues. Again, "IF" its true that Catcher is a waste of time? Doesn't make sense, Montero has more value as a prospect as a Catcher as long as he can fool one or two scouts into thinking he might be able to hack it there long-term. You always leave a prospect at a premium defensive position until it becomes painfully obvious that they won't be able to play it. Bingo. If the Yankees believe Montero can't play catcher but other teams think he might, the Yankees could use him as a valuable trade chip. In other words, they maximize his trade value if that's what they are after. I hope not. Every expert, every scout say this guy has 40 home run type power. I want him in pinstripes, weather it is behind the plate, outfield, or DH. I hope he makes it too. I've not seen him play personally, but all reports i've seen and his stats so far indicate he has stud potential. All I was saying is that I wouldn't want him to make the switch from catcher until it's abundantly clear to everybody he can't make it there. It never hurts to have a guy maximize his trade value, even if you don't end up trading him. It just gives you more options. I daresay that unless he's completely slow or uncoordinated, he can figure out a corner outfield spot in a couple seasons if it comes to that. When a young kid is as far away as Montero (I'd say at least 2-3 years), I don't think you should worry about him when signing a big time player. If his bat continues to develop and he brings it to the majors, we'll find a spot for him. 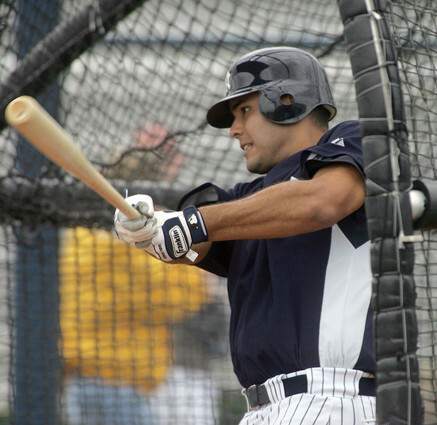 Montero is going to end up playing Catcher the Yankees are in serious shape at that position. Posada is shot and Jose Molina proved last year he isnt an everyday Catcher anymore. The Yankees will have to piece somthing together until montero is ready to come up. Franchise power hitting catchers are hard to come by thats why I see Montero playing Catcher in a couple of years I dont see the problem with his frame or size he is the perfect size to play Catcher. Look at Joe Mauer 6-5 230 is one of the top Catchers in the game. I dont see how Montero being a Catcher hurts his development. Last edited by nyjets1969; 12-24-2008 at 09:53 PM. Jose Molina has never been a full time catcher, what are you talking about ? but he did show he is one the best defensive catchers in baseball. I would defiantly re-sign him after next year. He's very valuable. Yankees are also stocked in the minors at the catching position, hopefully one of them pan out. Last edited by Tyler Durden; 12-24-2008 at 10:16 PM. Jose Molina has never been a full time catcher, what are you talking? but he did sho he is one the best defensive catchers in baseball. I would defiantly re-sign after next year. He's very valuable. Yankees are also stocked in the minors at the catching position, hopefully one of the pan out.